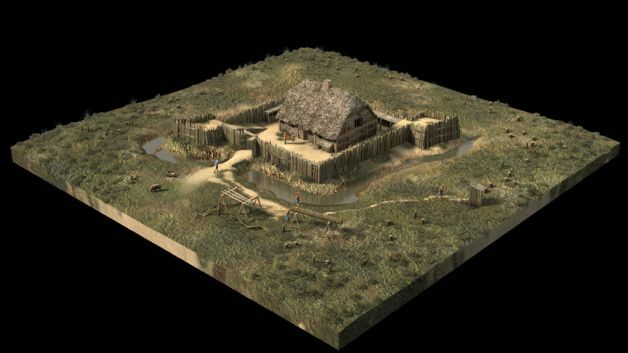 Among historians and academics, the precise location where Fort Nassau, the earliest precursor of Albany, was built in 1614 has never been settled and the long-running debate about the site of the crude Dutch trading post will take center stage at the 37th edition of the New Netherland seminar Saturday at the State Museum. The title of this year’s daylong seminar is “1614” in honor of the quadricentennial of the fort’s construction. Last month, independent researcher John Wolcott, of Albany, garnered international news coverage when he announced he had used old maps to pinpoint the fort’s location at the northern end of a rail spur at the Port of Albany along the Hudson River’s west bank, near a pocket park in the city’s South End. “I don’t agree with John, but I’m also not interested in picking a fight. The location is not going to be settled easily,” said Len Tantillo, of Nassau, a noted artist who creates meticulously researched and skillfully executed paintings of Dutch Colonial Albany scenes. He will present an illustrated lecture highlighting the three-dimensional computer models he has created that places the fort about one-half mile south of Wolcott’s site, in the heart of the port, along the west bank of the Hudson near the mouth of the Normanskill Creek. What interests Tantillo is the scale, construction methods and fortification of the Fort Nassau, where a small band of 10 or 12 Dutch traders acquired beaver pelts and other furs from local Native Americans and lived in primitive conditions. Tantillo found documentary evidence that suggested the fort featured a large barn-like structure with a thatch roof and wattle and daub construction that measured 26-by-36 feet and was surrounded by a stockade fence of upright small timbers. Cooking and heating was done over a sunken fire pit in the middle of a dirt floor, with roof ventilation. It was heavily fortified with two cannons and 11 swivel guns. “There was a real concern of attack because Indians were killing people a short distance downriver from the fort,” Tantillo said. Tantillo’s presentation is one of seven that will be given throughout the day by researchers from as far away as Arkansas, California and the Netherlands. “This is a little-explored period of Dutch history and we wanted to put the Fort Nassau period in context at this year’s seminar,” said Marilyn Douglas, vice president of the New Netherland Institute, the event’s sponsor. This year also marks the 40th anniversary of the start of the marathon translation work of 17th-century Dutch records by Charles Gehring, director of theNew Netherland Research Center. About 130 participants have pre-registered, a large turnout for the return of the seminar to Albany after it was held in previous years in Delaware, Schenectady and New York City. Another presentation by Dutch scholars Oscar Hefting and Hans van Westing will describe a fortified Dutch trading post in the wilds of Brazil where the pair has conducted research at an archaeological dig for the past two years. In addition to morning and afternoon sessions, highlights of the seminar will include announcements of two research awards and the winner of the 1614 quilt, which includes a Dutch sailing ship designed by Tantillo and an intricate pattern quilted by Bonnie Urso and Tantillo’s wife, Corliss. Hundreds of tickets have been sold for the quilt raffle.